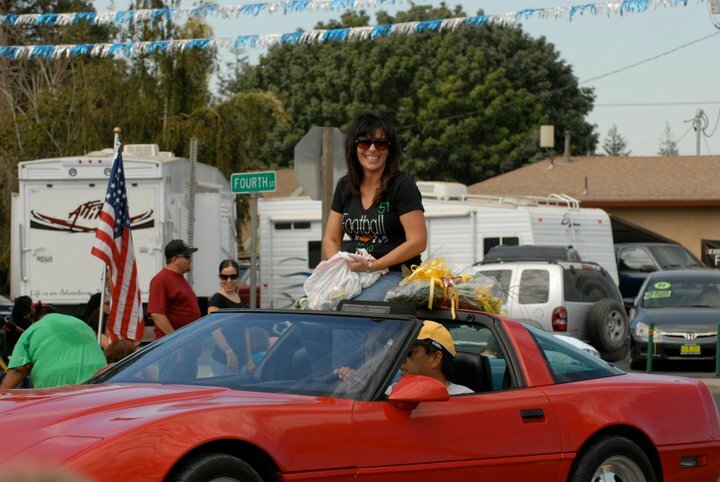 This photograph was from one of Hilmar High School's elaborate homecoming parades. They really know how to do it right in Hilmar... and I'm not being sarcastic. (No, really. I'm not.) Their floats are awesome, the trailers with players, and cheerleaders and clubs are awesome... and the whole damn town goes out on Lander to watch. Everyone. This particular year, Anne was named "Football Mom of the Year." I'm sure she was eligible (and nominated) each and every year her boys were in high school, but this was the first time the honor was officially bestowed up on her. It was well deserved. She works very hard to make sure her boys (the whole team) have what they need during the season. Going "above and beyond" is an understatement. But as much as she loves to do for the team, she prefers to be behind the scenes and not the recipient of praise or glory. She does what she does out of love. Nothing more. Of course I have to twist it around and tease her about all of the notoriety. Each year when it's time for the homecoming parade, I ask her about the car she'll be riding in, or whether she's getting her hair done for the occasion or if they are getting her a corsage this year. But I do it out of love. I do it because I'm proud of her.